This Spotty Dotty Sweetie Cone is perfect for the sweet toothed Bride to Be. It's perfect for sprinkling over tables and including in gift bags at the end of the Hen Night/wedding. 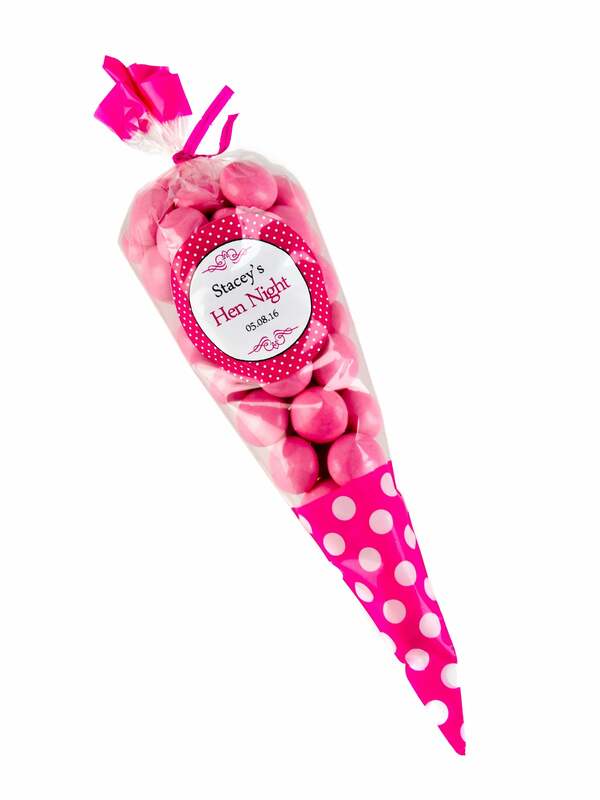 This gift set is filled with Pink Bon Bons in a 24.7 cm cellophane cone with personlised stickers. Looking for more gift bag fillers? Check out our selection of wedding favours and novelty accessories, such as this cute Compact Mirror or a joke Shot Glass Ring. Showing our 3 Hen Party Superstore x1 Personalised Hen Party Favour kit, Spotty Dotty Sweetie Cone reviews with an average rating of Very Good. Would you like to write a review? I only ordered 1 as a spot prize & it came ripped in two places, the personalised sticker was lovely but the cone wasn't up to the job. May just be too delicate for delivery. Plenty of sweets but "pink pearls" just means strawberry bon-bons. Sweets were good and the personalised stickers went on well but some of the cones were split down the side with the sweets spilling out. had to try and make good. Would say order more than you need to compensate.